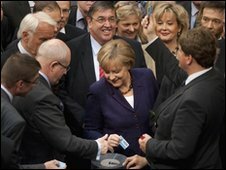 Germany's parliament has approved a 22.4bn euro (£19bn) contribution to a bail-out plan for debt-ridden Greece. The lower house, the Bundestag, passed the bill after fiery criticism of Chancellor Angela Merkel. The upper house also endorsed it. Greece's 15 partners in the eurozone will lend it 80bn euros spread over three years - the IMF 30bn euros. Later on Friday, Chancellor Merkel will join other eurozone heads of state for an emergency summit in Brussels. They aim to finalise details of the loan package to Greece, while the G7 finance ministers are also due to discuss the Greek debt crisis and its implications for the global economy. Concerns about Greece's economic crisis have spread fear of contagion in global markets. France's Cac 40 index fell by almost 2% and Germany's Dax index down 1%. Leading Asian shares indexes had slipped overnight, with Japan's Nikkei closing down 3.1%. The bill was passed by 390 votes to 72, with 139 abstentions in the German lower house, the Bundestag. Mrs Merkel has defended her plan, saying the EU was at stake. She had warned that if the 27 member states did not work together on such crises, "the markets will think we're unable to act". Greece's economic reforms that led to it abandoning the drachma as its currency in favour of the euro in 2002 made it easier for the country to borrow money. Greece went on a debt-funded spending spree, including high-profile projects such as the 2004 Athens Olympics, which went well over budget. It was hit by the downturn, which meant it had to spend more on benefits and received less in taxes. There were also doubts about the accuracy of its economic statistics. Greece's economic problems meant lenders started charging higher interest rates to lend it money and widespread tax evasion also hit the government's coffers. There have been demonstrations against the government's austerity measures to deal with its 300bn euro (£267bn) debt, such as cuts to public sector pay. Now the government is having to access a 110bn euro (£95bn; $146.2bn) bail-out package from the European Union and International Monetary Fund. Greece's problems have made investors nervous, which has made it more expensive for other European countries such as Portugal to borrow money. Mrs Merkel's critics used the emotional Bundestag debate to criticise her handling of the crisis, saying she had been slow to act, says the BBC's Steve Rosenberg in Berlin. The opposition Social Democrats abstained, saying the burden of the country's contribution fell too heavily on ordinary tax payers rather than on the financial markets. But the bill was passed as Mrs Merkel's Christian Democratic Union and its coalition partner, the Free Democratic Party, have a comfortable majority in parliament. Finance Minister Wolfgang Schaeuble had asked the opposition to support the legislation, saying markets would "pay attention to how the help is being backed on a national level". The German press has labelled the country's contribution as "the fattest cheque in history". Even if the legislation is approved, one group of Eurosceptic academics will challenge the decision in Germany's highest court, our correspondent says. On Thursday, Greek MPs approved drastic spending cuts in exchange for an international rescue plan, amid violent protests in Athens. The austerity measures include pay and pension cuts for public sector workers, and tax rises. But there is deep anger at the programme in Greece, which has seen days of occasionally violent protests outside parliament. The French Senate has also approved France's contribution of up to 16.8bn euros to the aid package for Greece. Italy's government also adopted a decree to supply 5.6bn euros as part of its 14.8bn aid contribution to Greece. Germany and France have already called for the single currency's rulebook to be rewritten - with tougher sanctions for those countries that run up big budget deficits, our correspondent adds. Fears of contagion from Greece's debt crisis have rocked global stock markets, with Europe's benchmark indexes opening sharply lower on Friday after US and Asian stocks incurred major losses. Could the UK face the same problems? Is the Greece bail-out a good deal?